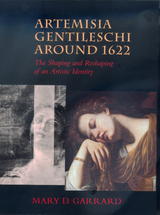 Mary D. Garrard, author of the acclaimed Artemisia Gentileschi, furthers her study of the seventeenth-century artist in this groundbreaking investigation of two little-known paintings. Taking as case studies the Seville Mary Magdalene and the Burghley House Susanna and the Elders, paintings of circa 1621-22 attributed to Artemisia, Garrard examines the ways that identity, gender, and market pressures interact both in the artist's work and in the criticism and connoisseurship that have surrounded it. Mary D. Garrard is Professor of Art at American University. She is the author of Artemisia Gentileschi: The Image of the Female Hero in Italian Baroque Art and coeditor, with Norma Broude, of Feminism and Art History: Questioning the Litany; The Expanding Discourse: Feminism and Art History; and The Power of Feminist Art: The American Movement of the 1970s, History and Impact.